MITUSHI ENTERPRISES, become reputed company in the market company under the guidance of our Founder Mr. Naresh Trehan B.Tech(Mech) with 42 years of experience in the field of Agriculture Implements/Sprayers was set up in the year 2000. 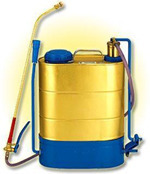 Our Products ranges includes all kind of Foot Sprayer, Fertilizer Broadcaster, Sprayer Accessories, Solar Sprayer, Knapsack Sprayer and many more. We always uphold the quality first, customer first as co-operation purpose, depending on the quality as root of enterprise.honesty, excellence as operation philosophy, commitment to brand strategy, & continuously expansion technical devotion. We look forward to build a long term Business Co-operation relationship with our Customer to achieve Mutual Development & Prosperity. Honesty, Excellence as operation Philosophy, commitment to Brand Strategy and Continuously Expansion Technical Devotion. Our up to date infrastructural facility enable us to offer the best quality products to our renowned customers in the most efficient manner. This infrastructure is divided into different sub-units like procurement, manufacturing, quality testing, warehousing & packaging, R&D and sales & marketing. The entire process is supervised under the direction of our skilled and experienced professionals. A leader has the vision and conviction that a dream can be achieved. He inspires the power and energy to get it done. Our goal at HYMAX is to provide best quality product and services to our customers. Workmanship is completely guaranteed and shipping can be organized to any destination national or international. Our beliefs are simple and heartfelt. We believe in quality to ensure complete satisfaction to the user. Owing to our vast experience in the concerned industry, we are offering a comprehensive array of products.